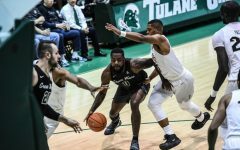 Despite a quick and early lead, Tulane men’s basketball (4-18, 1-9 American Athletic Conference) was not able to remain ahead and fell to Temple (12-11, 3-7 AAC) 79-71 Tuesday night at Avron B. Fogelman Arena in Devlin Fieldhouse. Redshirt junior guard Cameron Reynolds had an impressive showing, despite the team’s defeat. He scored 18 of his career-high 29 point in the second half, shot 11-for-22 and had nine rebounds overall. Senior center Ryan Smith recorded 11 points, six boards and three assists while redshirt senior guard Malik Morgan registered 10 points. Sophomore forward Sammis Reyes also had a personal-best with nine points on 4-for-5 shooting in 22 minutes of gameplay. After the Wave achieved a 13-6 lead, the Owls went on an 11-3 scoring run to take the lead, 17-16. 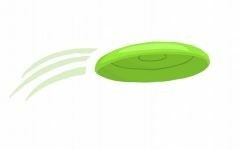 The lead continued to shift throughout the first half of the game, and the teams went into halftime tied at 34. 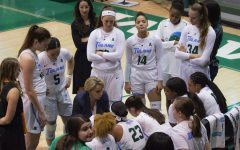 In the first half, Tulane accumulated a 22-13 rebounding advantage and outscored Temple 18-12 in the paint and 16-8 on second-chance baskets. 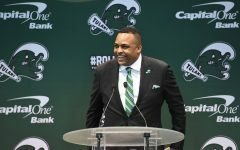 There were also nine turnovers, four on Morgan and three on Smith. “We play hard, but we let them shoot too high of a percentage from the field, and I thought that our turnovers really hurt us because they were not forced,” head coach Mike Dunleavy, Sr. said. When the second half started, the Owls quickly took control with a 45-38 lead by the first media timeout. Temple’s lead continued to grow, and in the final seven minutes, the Wave was behind by 13. 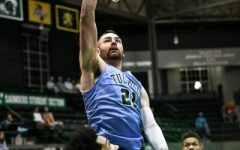 Over the next three-and-a-half minutes, Tulane went on a 12-3 run, establishing the score as 69-66 with just over three minutes left in regulation. 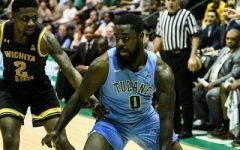 The Owls did not let up and responded to the Wave’s run with successful free throws and stops, ending the game with an eight-point victory. 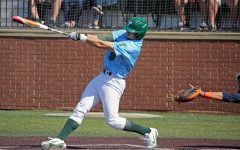 The Tulane Green Wave next suits up at 1 p.m. Wednesday, Feb. 8 in Greenville, North Carolina to battle it out against the East Carolina University Pirates.